For Kate Tarker, it’s the realization of a young playwright’s dreams. For starters, the Wilma Theater commissioned a play from her: Dionysus Was Such a Nice Man, which has its world premiere April 23-May 12. She’s first in a glittering series of commissions — Jacqueline Goldfinger, James Ijames, Christopher Chen — for HotHouse, the Wilma’s resident company, an incubator for exploring experimental and physical theater. Tarker, based in New York, who did much of her growing up around here — “the family seat was around Wallingford,” she says — is now in Philly. She’s working with the company she wants in the red-hot HotHouse gang, and the director she wants in French physical-theater master Dominique Serrand. “I self-identify as a comic writer,” Tarker, 34, said one recent morning at the Wilma. But until fairly recently, she didn’t identify primarily as a writer. Tarker started as a painter, and a few years ago, she went to Conkouati-Douli National Park in the Republic of the Congo to make paintings of monkeys. Except her paint didn’t come. For a long time. She was stuck in the remote refuge, with lots of monkeys and no paint. Although that first effort was “probably bad,” in her words, she kept at it, and her star has quickly risen with plays such as Thunderbodies and Laura and the Sea. The New York Times listed Thunderbodies among its unforgettable theater moments of 2018. In Dionysus, a shepherd family near the city-state of Corinth learns that one of their own, a guy named Oedipus, is to become king. It’s party time — with far-reaching consequences. Theirs is the ultimate in dysfunctional families. “They’re not a royal family,” Tarker says. “I’m kind of reclaiming tragedy. It’s not just the province of the high-born. … Whenever someone has power, there’s an enormous potential for that person to abuse the power. 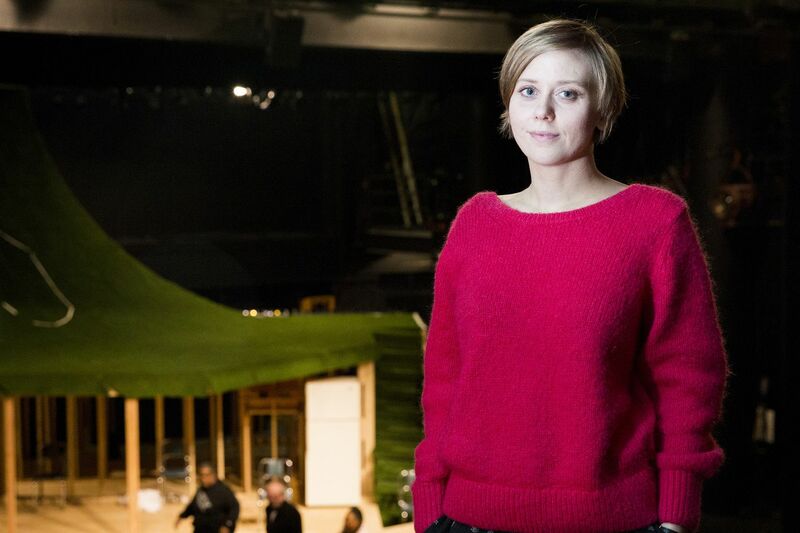 Tarker saw the debut of the HotHouse company in its 2015 production of Antigone. That inspired her to approach the stuff of tragedy through comedy and physical theater. Physical theater involves movement, acrobatics, and clowning. Philadelphia is internationally renowned for it, with physical theater troupes that include Pig Iron Theatre, Lightning Rod Special, and Tribe of Fools. Tarker is exquisitely versed in it. Her teacher at the Yale School of Drama was Christopher Bayes, a student of Serrand, who has influenced companies (including Pig Iron) in many countries. Tarker asked for Serrand to direct Dionysus — and got him. She says it’s thrilling to work with HotHouse. Five HotHouse members are in the cast: Ross Beschler, Taysha Marie Canales, Keith J. Conallen, Melanye Finister, and Matteo Scammell. When she lifts her eyes finally, her answer is beautiful. “What excites me,” she says, “is that, if done right, clowning is not ironic, not parody. It’s a state of incredible vulnerability.